Yes, I have finished nine snowflake blocks. They are fun but a challenge. Like all snowflakes there is no two exactly alike. Have six more to make. Don't know just how I will finish this quilt off. Will wait and see. Now the quilting group I'm in on Yahoo groups, Quilters Hollow, always has a special swap the first of the year in memory of one of our early , very active members that died of cancer. This year we are going small with six inch blocks. Don't remember the name of it but one of the log cabins. Here is the block, Of course all fabrics are Thimbleberries since this is what the group is all about. Using lights and darks. We are doing it in sets of 8 which makes a neat larger 12 inch block. I've done 3 sets but think I will do one more. As I've been playing around on the design wall and have come up with this design. First I had the blocks arranged into six stars. Then rearranged them leaving a border and with one more set plus about 4 extra blocks I could have the partial stars all around the border and then put a large border . I want to use this as a table topper. I have been using the smaller quilts that I didn't know what else to use them for, on the dining room table. Well it's in the kitchen and is the only table we have. 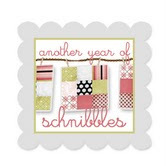 This is such a fun block and you can use up your scraps. Ever since Bonnie has been talking about cutting strips of the leftovers, I've done this with both my regular scraps and my TB. Separated them of course. Today turned out to be such a wonderful warm winter day, and have you noticed that the days are getting a little longer. Still light at five when we eat. I went to town this afternoon to the Credit Union to get the money for my new car. But came home empty handed. Their system was down and couldn't get into the accounts. What's up I thought our money was safe. She will have a check ready for me in the morning. Will just have to make sure the people don't go running to the bank for a couple hours to give me time to deposit it here in Boonsboro. So hopefully tomorrow at this time I will have a new car. This is the first time that I alone have taken care of the buying. Now Hubby was only interested in whether or not he could get in and out of it and that it had a handle above the door for him to hold on to. He just doesn't trust my driving. It's time this evening to get busy and start another snowflake. Need to get these done before the hope of snow is gone. Thanks again to all left a comment on yesterdays blog. I just felt I wanted you all to know what a milestone we have passed. What a nice set of background paper you have added to your blog. I love your snowflakes and the blocks for your thimbleberry are wonderful. I have never made the pineapple log cabin block and this variation is really lovely. What size strips are you using in your thimbleberry blocks? I think that it is really cool the way the blocks form into star shapes. I hope you have no more hitches when you pick up the car. Your snowflakes are looking great! I can hardly wait to start the hats that are the same type of blocks, but I think the snowflakes are probably more fun! The block for the swap is nice too. Great blocks, Eileen! 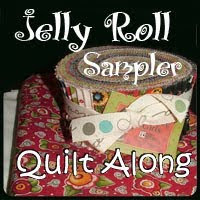 If you remember the name of the Quilters Hollow block I would love to know it - I can see a lot of my scraps going to one like that! I like those snowflakes. THey look great and those log cabins are wonderful! So pretty and I love the colors. Yes, in deed you have been doing some sewing! They look great. You know since I have started back quilting, I can see how it is helping me with life's journey. I laid it down for a long time and looking back I wished I had not done so. I think that is why I feel so happy and joyful around other quilters and when I am doing something on my quilting or learning , and there is so much to learn. Thank you for being a leader and sharing your example of kindness during the hard times and joys in the good times. I heard from a little birdie that you feed the wild birds too. Ain't life grand. What a nice set of background paper you have added to your blog. all the best with the new car and keep up you great work blogging, you are a inspiration. I love what you are doing with the pineapple blocks! Looks terrific! And Happy Anniversary to you! Wow, 60 years! Bless you both!